An absolutely scrumptious gluten-free morning glory bread packed with apples, carrots, raisins, walnuts, coconut, greek yogurt, and poppy seeds! Big on flavor, filling, and makes an excellent breakfast or afternoon treat with tea. 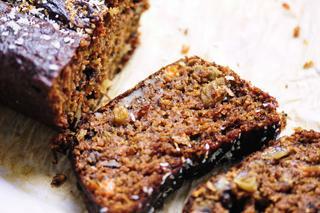 This beautiful Morning Glory Loaf makes for one decadent, healthy, and filling breakfast or treat! Packed full of yummy and nutritious ingredients, this bread will have you coming back for slice after slice . . When I threw this delightful bread together, I had a real craving for that classic Morning Glory muffin flavor. I decided on loaf form, and knew that I wanted it packed full of flavorful and healthy ingredients. I was very pleasantly surprised with how absolutely delicious it turned out. It has just the right amount of spice and rich, moist flavor! It is stuffed to the brim with hearty and filling ingredients - making it one tasty, vitamin-rich, high protein, appetite satisfying breakfast or not too sweet dessert! It also slices and stores extremely well. I have no doubt that you will love it! Preheat oven to 350°F. Grease or line a loaf pan with parchment paper. Set asideIn a large mixing bowl. Sift together ingredients all purpose flour through nutmeg.In another large mixing bowl, combine yogurt, milk, oil, honey, egg, lemon juice and vanilla. Whisk until smooth.Pour your wet ingredients into your dry ingredients. Mix until evenly combined.Gently fold in carrots, coconut, raisins, walnuts, apples and poppy seeds until evenly distributed. Pour your bread batter into your prepared loaf pan.Bake for 45-55 minutes, or until firm, turning golden and a toothpick inserted into center comes out clean.Let cool before removing from loaf pan, slicing and serving.Enjoy!